Original Door Protectors begin with an email request, followed by a verbal communication regarding the clients' needs. Sizes are also based on the clients' needs. As this sacred art piece will hang above the front door on the inside, it is important that the available space between the door an the ceiling be determined. Creating and installing door protectors involves various communications and modes of communicating. A commission begins with the initial email request, followed by a 30 minute phone communication, followed by an intuitive reading by Lidia. Conception and creation time of the sacred art varies and it is based on the previous steps. As a completely intuitive creation, it requires the client's readiness, particular circumstances and other factors, along with the artist's spiritual guidance to insure a successful outcome. Door Protectors measure 6" H x 12" x 1.25" D - $450.00 (standard size). Additional sizes include 6" x 24" or 8" x 20" - $900.00. Larger sizes are available upon request. 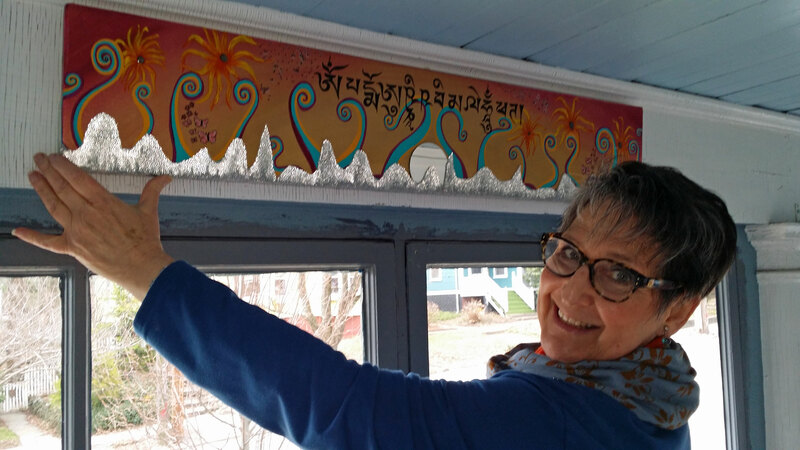 Installation can be remote via Skype or other app, or done in-person by Lidia, if within 45 minutes from Arlington, MA. The installation ceremony includes discussion of the intuitive reading and follow up instructions to insure success. Installation instructions and intuitive reading report is mailed ahead of time if the art is shipped beyond the geographical parameters. Shipping charges will be determined by size and destination, but a typical 6" x 12" x 1.50" piece shipped within the continental USA ranges between $11.00 and $15.00. Prints from the original art can be ordered in the same size or in smaller sizes. Each art listing includes available options under the particular work. Prints are printed on archival paper with giclee process and have excellent visual texture. They are signed by the artist. Canvas prints are wrapped on 3/4"or 1.50" gallery strainer bar. Canvas prints of the same size as the original are embellished with some of the media as in the originals. They also carry the same blessings as the originals. See Door Protector Shop for available prints and contact the artist for prints of any other art on the site. Notecards and Postcards can be ordered from any art images on the site. Please specify the image desired by email. Depending on the season, you should receive your cards within 10 days of order. There are 10 cards to a package with envelopes inside an organza bag. All art is also available as a printed, pre-pasted mural, easy to remove & carry off when necessary. Murals are $14.00 per s.f. We welcome commissions for art and murals, & will respond within 24 hours to discuss the commission. After consensus is reached on subject, size and other factors, a full quotation and expected shipping date will be provided within 48 hours. Gift Certificates are available in varying denominations starting at $25. 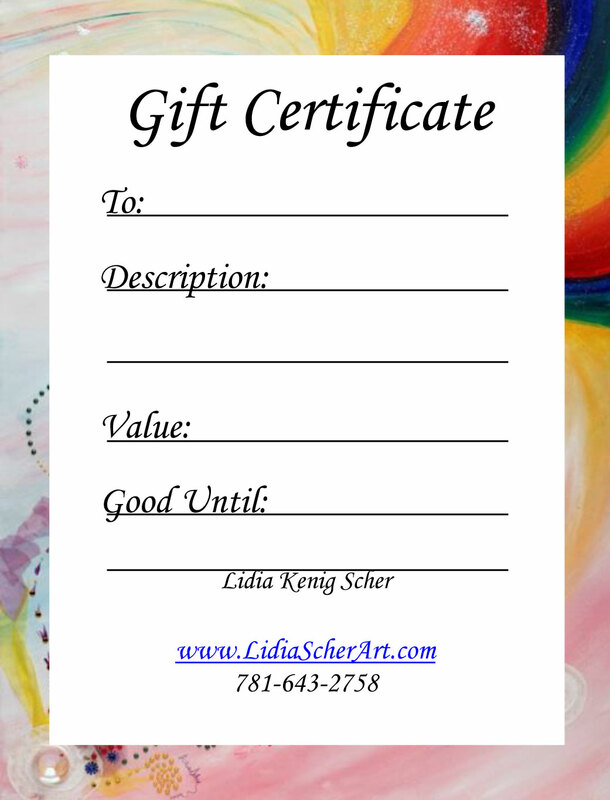 To request a customized gift certificate, contact Lidia directly. We ship worldwide in crates or boxes, depending on the size of the art. Art is shipped insured within the continental USA and free of charge to the buyer, except Door Protectors (see above). International shipping rates vary per country & region. Please request quote via e-mail through the contact link. Original art may be returned for a full refund, provided that art is returned within seven (7) days of purchase, free of any damage and in the original packaging. Buyer is responsible for return and insurance shipping costs.